Two weeks ago, we ventured off into one of my favorite spots- the San Gabriel mountains- where we did a night hike about 3 miles in to a cool little spot where we panned for gold and had a relaxing weekend! 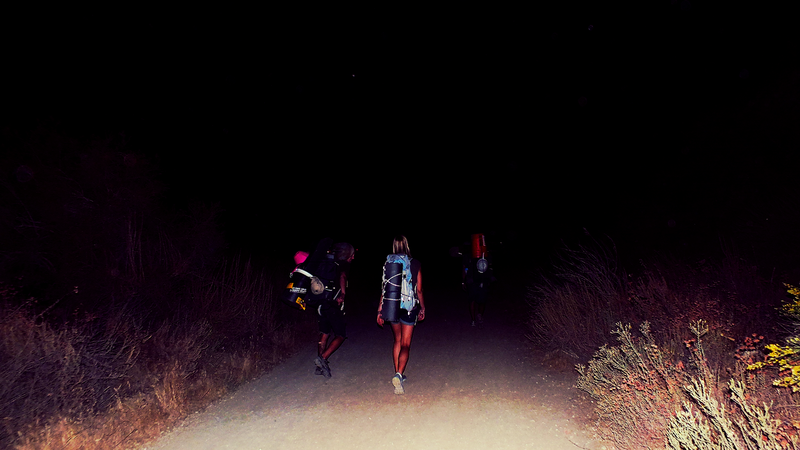 I love night hikes because you can only see what’s in front of you- not what’s ahead! There is something exciting and adventurous about it! Here are some pictures from that trip! Ah, night hiking. It’s been a long time since I’ve done that. I always liked it because it was so much cooler at night, the sun wasn’t around to sap your energy as quickly as if you were hiking during the day. Yes the cool weather is basically amazing!!! You should get out there again! What a cool experience. We’ve been thinking about doing an early morning hike to one of our favourite spots to watch the sunrise……. so far sleeping keeps getting in the way! Great photos. Good looking blog. I do a team night hike every year for charity, 18 miles across the moors with clues to answer and navigating only by map and compass. Thanks for the like on Diary of an Internet Nobody. I’m not a girlie, but I love walking (X-C skiing or snowshoeing) in the wildlands at night. Especially on a bright moon night when the colored landscape is mostly black and white. A full moon during winter months with snow is really something special. Around here the pucker factor is a little higher at night because we share our big backyards with bear (black and grizzly) and cougar which puts us a little lower on the food chain.